The vibrant, non-settling colors of this Prang tempera blend easily, with creamy smooth textures and good working characteristics. Ultra-Washable technology makes cleanup of Prang Ready-To-Use Tempera easy. This paint is ideal for pre-kindergarten and elementary children. The bright colors adapt to any creative project. Set of 8 with Brush — This set contains 0.8 oz (25 ml) jars of Red, Orange, Yellow, Green, Blue, Purple, Brown, and White, plus a paintbrush. Assorted Set of 12, 16 oz Bottles — This set contains 16 oz (473 ml) bottles of Black, Blue, Brown, Green, Magenta, Orange, Peach, Red, Turquoise, Violet, White, and Yellow. 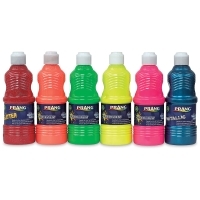 Fluorescent, Metallic, and Glitter Set of 6, 16 oz Bottles — This set contains 16 oz bottles of Fluorescent Green, Fluorescent Orange, Fluorescent Yellow, Fluorescent Pink, Metallic Turquoise, and Glitter Red. 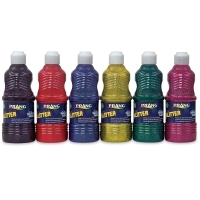 Glitter Set of 6, 16 oz Bottles — This set contains 16 oz bottles of Glitter Pink, Glitter Purple, Glitter Yellow, Glitter Green, Glitter Blue, and Glitter Red. 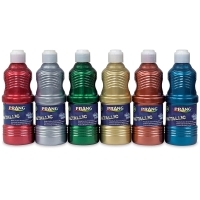 Metallic Set of 6, 16 oz Bottles — This set contains 16 oz bottles of Gold, Silver, Copper, Metallic Red, Metallic Green, and Metallic Turquoise. 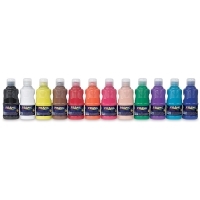 Assorted Set of 12, 8 oz Bottles — This set contains 8 oz bottles of Red, Yellow, Orange, Blue, Green, Violet, Brown, Black, White, Turquoise, Peach, and Magenta.